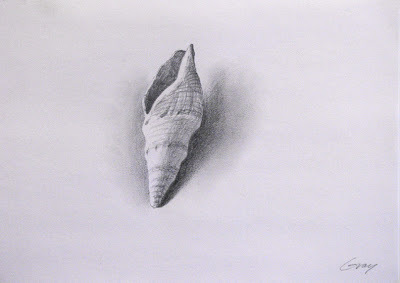 Pencil on archival paper, 8" x 11"
I thought I had retired the seashell theme for a while, but yesterday my artist friend Linda Peterson brought me a box of shells and rekindled my interest. Thanks, Linda. Actually, one of the things I like best about doing these small paintings and drawings is their unplanned nature. I never know for sure what I'll be doing from day to day. The spur of the moment nature of the process is a large part of the fun of it.